You can save money by making your own bath and shower gels, but perhaps the nicest thing about making your own bath formulas is that you know exactly what goes into the bottle or jar. Essential oils can be a lovely addition but, as with any product applied to your skin, some people can have an allergic reaction. Only use ingredients that you know are safe for you, and avoid using essential oils at all for pregnant women, babies and children. Essential oils are typically stronger than fragrance oils, and each formulation has its own aromatherapy uses. Good choices for relaxation and stress relief include lavender, chamomile, clary sage, rose, sandalwood and neroli. Citrus lemon or lime oils, as well as mandarin orange, are fresh and uplifting, while rosemary or peppermint are good for rejuvenating energy. Other possibilities include almond, apricot, rose geranium, jasmine, sage, tangerine or thyme. If your skin is dry, try adding one or two tablespoons of aloe vera gel to your bath gel recipe for a moisturizing effect. For exfoliation, add a teaspoon or two of salt or sugar. Add color to gel recipes with a drop or two of food coloring. In a small saucepan, heat the water to boiling and stir in gelatin to dissolve. Remove from heat and add shampoo very slowly, stirring just enough to combine all ingredients. Pour the bath gel mixture into a clean jar. Set and store in the refrigerator. To Use Bath Gel: Scoop out a little bath gel as required for your bath. Gently stir together shampoo, water, salt and your choice of scented oil in a small bowl. Store in a small bottle or pump container. Add shampoo, salt and essential oil to a blender, along with 1/4 cup of the water. Blend these ingredients until the mixture is thoroughly combined and thickened. The gel will likely be too thick at this point; if so, add more of the water until you get the right consistency. 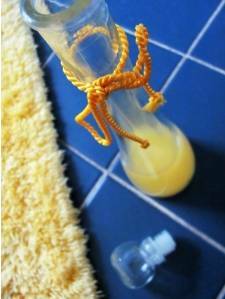 Pour gel into a jar and store in the bathroom. Use in the same way as you would commercial shower gel. Add shampoo and 1/4 cup of water to a small mixing bowl. Stir in salt, essential oil and aloe vera gel. Gradually add more water, in small increments, until gel has desired consistency. Funnel into a one jar or bottle. Add a dollop of herbal shower gel to your palm and use as a substitute for soap in the bath or shower.Disclaimer: Recipes are compiled from online sources or have been submitted by readers. They have not been personally tested by the author. Use at your own risk and exercise due caution when applying any homemade formulation to your skin. 1 or 2 drops food coloring. Mix the soap and water, then stir in 1/4 teaspoon of salt. Add more salt, using 1/4 teaspoon each time, until mixture is thickened. Add remaining ingredients and stir until smooth and blended well. Gently stir 1/2 cup of the water, shampoo and salt together in a small mixing bowl until both the shampoo and salt are dissolved. If the gel is too thin, add a little more shampoo; too thick, add more water. Use as a base for the following recipes or as a beginning for your own concoctions. To your base, add two tablespoons of aloe vera gel, 12-16 drops apple fragrance oil and, if desired, 2 drops of green food coloring. Stir well to blend. Store in a jar, pump or squeeze bottle. Add one tablespoon of vegetable glycerine, 10 drops of vanilla essence or extract and 4 drops of rose essential oil to the base recipe. If desired, you may also add one to two drops of red food coloring. Add 1 tablespoon apricot kernel oil, 15 drops of peach fragrance oil, the contents of two Vitamin E capsules and, if desired, one or two drops of orange food coloring. Stir gently until smooth and thick. Add two tablespoons powdered milk to the warm water of the base recipe, then stir in the shampoo until well blended and thick. Add the salt, 10 drops of lavender oil and 1 drop of violet food coloring (optional). Stir until well mixed. Enjoy! Can the bathroom gel harden through time?